^ Galloway, Vickie (January 1998). 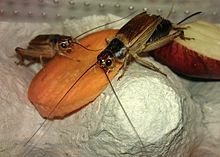 “Raising Crickets”. Scarabogram (Scarabs: The Bug Society) (213): 2–3. http://crawford.tardigrade.net/bugs/cricketsuppl.html. ^ Kulzer, Louise (March 1998). “House Crickets”. Scarabogram (Scarabs: The Bug Society) (215): 2–4. http://crawford.tardigrade.net/bugs/BugofMonth31.html.